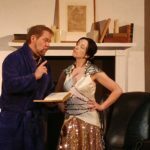 Consider that: mysteries are an extremely potent form of storytelling; opera is a powerful means of dramatic expression; and science is in desperate need of connecting with the public. So, what could be more obvious than a scientific mystery formulated as an opera?! 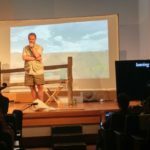 That’s exactly what I did as the librettist (the fancy term for the person who writes the lyrics) for Locust: The Opera which premiered at the National Wildlife Art Museum outside of Jackson, Wyoming, on Friday, September 28. The voices included a Scientist (Todd Teske, tenor); Rancher (Erik Angerhofer, baritone), and Locust/ghost (Cristin Colvin, soprano)—along with the Colorado Chamber Orchestra conducted by Thomas Blomster. The response of opera buffs, music critics, and neophytes was remarkably enthusiastic. Scientists have begun to understand that stories are central to communicating their work—and this approach drove a collaboration between myself, a composer (Anne Guzzo), and a visual artist (Ashley Carlisle) to craft the epic tale of the Rocky Mountain locust. People engage, understand and remember what they see or hear in a narrative context—and no storytelling framework is more darkly enchanting than a murder mystery. 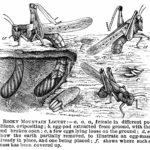 The tale of the Rocky Mountain locust, which formed a swarm covering nearly 200,000 square miles in 1875, was ripe for transformation into a commensurately grand art form. 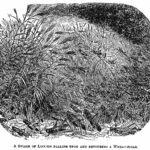 Perhaps even more remarkable than the breathtaking scale of its outbreaks, was the locust’s sudden disappearance with the last living specimen being collected in 1902. 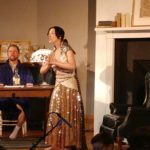 We promoted the opera as an “environmental murder mystery” in which the ghost of the Rocky Mountain locust haunts a scientist until he can crack the case of how a creature that once blackened the skies of the West vanished. The opera is based on my book, Locust: The Devastating Rise and Mysterious Disappearance of the Insect that Shaped the American Frontier (Basic, 2004). To get a sense of how the greatest whodunit in the environmental history of the West opens, watch the video below of the initial encounter between the Locust and the Scientist (complete with swarm sounds generated by the audience using tissue paper) during which she demands answers to the mystery of her extinction.